Crown and bridge are two popular restorations often used in full-mouth rehab, TMJ treatment, and individual restorations. 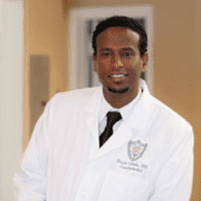 Mussie Sibhatu, DDS, MS, and the experienced dentistry care team at Laurel Smile Dentistry are ready to help Oakland, California, area patients learn how to smile again with custom crown and bridge teeth replacements. Use online booking or call to schedule an appointment today. A crown is a cover that protects a damaged tooth. Crowns are often the best way to cover a large cavity, a cracked tooth, a broken tooth, or a permanently discolored tooth. At Laurel Smile Dentistry, your dentist digitally measures your mouth and then custom-makes your crown the same day using the on-site CEREC scanner and machine. CEREC crowns are made from ceramic that's shaded to match your natural teeth shade and make them completely natural-looking. A bridge is a tooth replacement that conceals a gap in your smile. Along with crowns, they’re often an important component of full-mouth rehab. Many patients get bridges for both aesthetic reasons and functional reasons. A bridge can make it easier to chew, talk, and smile. Usually, bridges and crowns work hand-in-hand. The teeth on either side of the bridge — the abutment teeth — get crowns, as does the replacement tooth, also known as the pontic. The three crowns all look natural, making it virtually impossible to tell that one of them is a prosthetic tooth. How do I take care of my crowns and bridges? Care of your crowns and bridgework is remarkably simple: you simply need to maintain a regular oral care routine as usual. You can brush your crowns and bridgework with no problems at all, but it's best to use a soft-bristle brush to avoid scratching either the ceramic crowns or your natural teeth enamel. Floss as normal each day, but use a little extra caution around your bridgework. No sharp movements or tugging, as this might cause stability issues with your bridge. During your regular checkups, your dentist evaluates both your natural teeth and your restoration work. How can crowns and bridges help with TMJ? When you've got gaps in your teeth or other serious teeth issues, your other teeth can start to shift out of their normal positions. This can cause problems with your bite, and that in turn may lead to TMJ symptoms. By filling in gaps and doing other necessary restorations, your dentist can shift your bite back to normal again. For many patients, this alleviates TMJ symptoms long-term. For a crown or bridge consultation, book your appointment at Laurel Smile Dentistry online or by phone now.